The findings are based on a study of a "strange" bird that arrived on a remote island in the Galapagos archipelago 36 years ago. A study of birds, which live on the Galapagos Islands in the Pacific Ocean, has shown direct genetic evidence that new species can arise in just two generations. The findings, published in the the journal Science, are based on a study of a "strange" bird that arrived on a remote island in the Galapagos archipelago 36 years ago. "The novelty of this study is that we can follow the emergence of new species in the wild," said B. Rosemary Grant from Princeton University in the US. The researchers said that the newcomer belonging to one species mated with a member of another species resident on the island, giving rise to a new species that today consists of roughly 30 individuals. 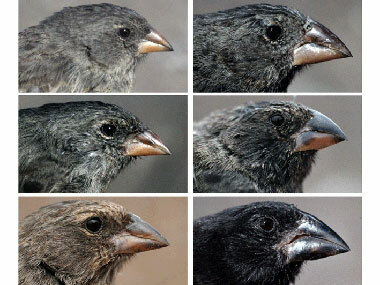 The study comes from work conducted on Darwin's finches, which live on the Galapagos Islands. The remote location enabled researchers to study the evolution of biodiversity due to natural selection. The direct observation of the origin of this new species occurred during field work carried out over the last four decades by Rosemary and Peter Grant, two scientists from Princeton, on the small island of Daphne Major. "Through our work on Daphne Major, we were able to observe the pairing up of two birds from different species and then follow what happened to see how speciation occurred," Rosemary Grant said. In 1981, a graduate student working with the Grants on Daphne Major noticed the newcomer, a male that sang an unusual song and was much larger in body and beak size than the three resident species of birds on the island. The researchers took a blood sample and released the bird, which later bred with a resident medium ground finch of the species Geospiz fortis, initiating a new lineage. The research team followed the new "Big Bird lineage" for six generations, taking blood samples for use in genetic analysis. In the current study, researchers from Uppsala University in Sweden analysed DNA collected from the parent birds and their offspring over the years. The offspring were also reproductively isolated because their song, which is used to attract mates, was unusual and failed to attract females from the resident species. The offspring also differed from the resident species in beak size and shape, which is a major cue for mate choice. As a result, the offspring mated with members of their own lineage, strengthening the development of the new species, the researchers said. Researchers previously assumed that the formation of a new species takes a very long time, but in the Big Bird lineage it happened in just two generations, according to observations made by the Grants in the field in combination with the genetic studies. One of the most striking aspects of this study is that hybridization between two distinct species led to the development of a new lineage that after only two generations behaved as any other species of Darwin's finches, explained Leif Andersson, Professor at Uppsala University.